"Hey, this is a little-known fact... an obscure, low-budget movie was made about it in the 90s." 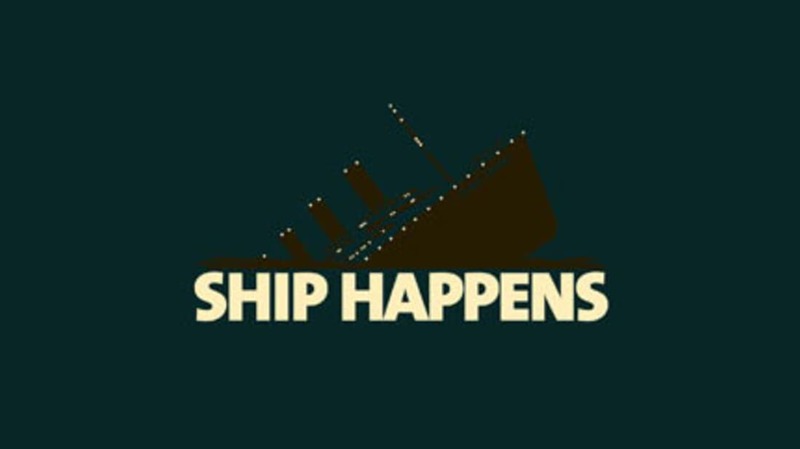 Seems like this ship was doomed. Captain Edward Smith actually changed course a little bit in response to iceberg warnings he received over wireless, but, obviously, icebergs were in the Titanic's future anyway. Two boats, the Amerika and the Mesaba, both sent messages to the Titanic to warn the captain that despite changing course, huge icebergs were still in the ship's path. Neither message made it from the wireless operator to the bridge. Around 11 p.m., The Californian sent word that they were stopped for the night because of the ice. Like the others, this message never left the wireless room. "¢Millionaire John Jacob Astor and his pregnant wife, Madeleine. They had been on their honeymoon when she became pregnant, which is why they booked tickets on the Titanic. Many legends about Astor and the Titanic are floating around, but none of them have ever been substantiated. It's rumored that he was the one who let all of the dogs out of their kennels so that they might have a fighting chance; it's also said that he put a woman's hat on a younger boy so that he would be mistaken for a woman and would be able to board a lifeboat. My favorite, though, is the rumor that when the iceberg struck the ship, Astor quipped, "I asked for ice, but this is ridiculous." "¢ Benjamin Guggenheim, the son of mining magnate Meyer Guggenheim and the father of museum founder and art collector Peggy Guggenheim. He was reportedly the one who said, "We've dressed up in our best and are prepared to go down like gentlemen." "¢ Isidor Straus, co-owner of Macy's department store. His wife, Ida, refused to leave his side even though she was offered a spot on a lifeboat. "¢ Molly Brown, who was friends with the Astors and decided to return home with them when she learned that her grandson was ill. Molly survived by boarding a lifeboat and tried to commandeer the boat when the boat's Commander, Robert Hichens, refused to go back and pick up people in the water even though the lifeboat was only half-full. "¢ Dorothy Gibson, who, after Mary Pickford, was probably the best-known and highest-paid silent film actress of the day. She survived and made a film about her escape from the Titanic, even wearing the same clothes she wore on that fateful night "“ a white silk dress with a cardigan and polo coat. She may have been the inspiration for Rose in the 1997 movie that you may have heard of if you like little indie films. Third-class passage was only about $36.25, although that was still quite a bit of money in those days, especially for a large family. Second class was about $66 and first class started at $125. The highest priced suite was $4,500, though, which was a huge amount of money "“ at the time, a decent house could be found for $1,000, so to spend more than four times that on temporary lodgings was pretty shocking. I suppose that's why they called it "The Millionaire's Suite". Both J. P. Morgan (right) and Milton S. Hershey (left) had reservations on the Titanic and surely could have booked the Millionaire's Suite. Mrs. Hershey fell ill so the Hersheys booked passage on a different ship "“ The Amerika. The Hershey museum displays a copy of the check Hershey wrote to the White Star Line as a deposit for his first-class room on the Titanic. The White Star Line was actually owned by J.P. Morgan, who was scheduled to be staying in his own private suite. He canceled for unknown reasons. Commander Charles Lightoller was the senior-most crew to survive, but even his was a narrow escape. When water washed over the bow of the ship, Lightoller decided that he might as well jump in the water voluntarily before it took him unexpectedly. He surfaced from his dive only to be sucked back under as water flooded one of the ventilators. He was pinned to the grates until a blast of air from the ship pushed him back up to the surface. He then helped passengers cling to an overturned lifeboat until they were rescued. He continued to be a hero even after getting back to dry land - it was his testimony and recommendation that spurred safety improvements such as basing lifeboat numbers on passenger numbers (instead of the weight of the ship), 24-hour radio communications in all ships and lifeboat drills for the passengers. It doesn't really exist, but at the time, people thought the ship was cursed from the start. The ship was supposedly assigned the number 390904. Read that backward in a mirror and it vaguely resembles the phrase "No Pope". The Titanic was actually assigned the number 401, so there's really no truth to the "curse" at all. The doomed steamliner wasn't found until 1985, when oceanographer Robert Ballard discovered it near Newfoundland using new sonar technology. He was actually just looking for debris, not the ship itself "“ over the years, experts decided that debris would have been scattered over a large area as the ship sank to the bottom of the ocean. Soon after sighting debris, the crew spotted a boiler and then the hull of the ship. The biggest discovery the team made is that the ship did actually split into two parts "“ both American and British inquiries had determined that the ship sank as one whole piece. Ballard and his crew didn't take any artifacts from the ship at the time; he considered it graverobbing. Eventually, though, more than 6,000 items were recovered and put on display at the National Maritime Museum in Greenwich, England. Many objects were also part of a traveling Titanic museum exhibit. Millvina Dean was the youngest person on the Titanic at a mere two months old. Her parents were moving from England to Wichita, Kansas, and managed to get third-class tickets for the Titanic. They never made it to Wichita - her father didn't survive the crash and her mother, being left with two small children, wanted to go home to England to be with her surviving family. Strangely enough, her brother, Bertram, died on April 14, 1992, the 80th anniversary of the Titanic striking the iceberg. 9. Was the accident foretold? Maybe Morgan Robertson was psychic. About 14 years before the Titanic sank, Robertson wrote Futility, a novel about the largest ship ever built hitting an iceberg in the Atlantic Ocean on a cold April night. The ship "“ The Titan "“ sank, leaving only 13 survivors out of 3,000. The Titan was also billed as "unsinkable" and was also a British ship on its way to New York. A little spooky, no?? What did all of these wealthy people dine on before going down with the ship? Well, it was quite a feast. Offerings at dinner on the night of April 14, 1912, included oysters, filet mignon, lamb with mint sauce, roast duckling, chateau potatoes, roast squab and cress, pate de foie gras, Waldorf pudding, peaches in Chartreube jelly, chocolate and vanilla eclairs and French ice cream. Second-class passengers didn't fare quite so well "“ their dinner was their choice of haddock, chicken, lamb or turkey, boiled rice, boiled potatoes, plum pudding, American ice cream, fresh fruit, biscuits and coffee. Third-class passengers received Irish stew, stewed apricots, fresh bread and butter and tea. Well, these are just a few stories. Share your Titanic facts, speculation and urban legends in the comments!